As anyone who has ever worked with me knows (and as is true of many lawyers) I am a perfectionist. If a client comes to me for legal help for their China manufacturing, I almost always question them about their potential or actual product supplier(s) and how they found them. I ask these questions because I know from experience how important it is to choose the right manufacturer and I am borderline obsessed with making sure our clients have the right manufacturer for what they will be doing. If choosing a good Chinese partner is important for protecting your IP, that choice is even more important for ensuring quality product on time. So we now get to the proverbial question: how do you choose the right Chinese manufacturer? 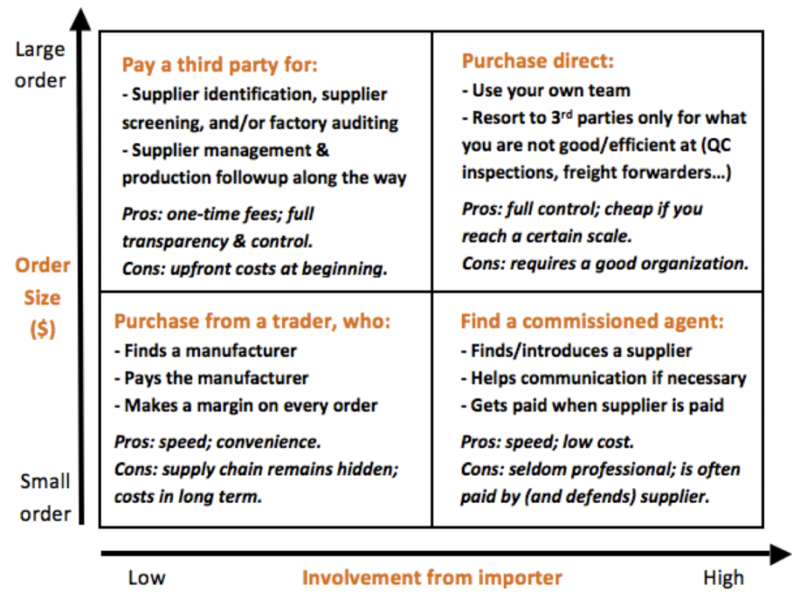 The baseline question then becomes whether you should find that manufacturer yourself or use a third-party sourcing agent to do so. Unfortunately, there is no one answer to this question. About all I can tell you here is that there are many bad sourcing agents and a few great ones and choosing a bad one is virtually always going to be worse than doing it all on your own. So if you do decide you need a sourcing agent, choose a good one. Today though I am going to pull from an excellent post from the always superb Quality Inspection Blog. The post is aptly named, Sourcing from China 101, Part 1: Do You Need a Sourcing Agent? and if this issue is relevant to your China business, I urge you to go there and read the whole thing. According to the post, 80% of importers go direct and thereby “control the whole process, and avoid paying commissions to any middleman or agent.” It states and I agree that “if you are organized enough to manage suppliers . . . .and if you can satisfy the minimum order quantities (MOQs) of suppliers, this is probably the best option for you.” I would, however, add “knowledgeable enough” to this sentence. How will they get paid, and by whom? Will you be able to visit the factories before/during production? Can they provide referrals or testimonials from satisfied customers who buy the same type of product as you? Make sure to contact two of them and get confirmations. Do they do quality inspections by themselves? Or do they resort to a specialized third-party? Will you get a report every time? Will you get an update every week on the production status? Can they share their management system with you? You need to make sure they have processes in place. The vast majority of agents don’t follow any established procedures. What guarantee do they offer in case a supplier scams you? If shipments are behind schedule? If you receive junk product in your warehouse? If you keep re-ordering the same products from the same sources, will you pay less for the sourcing agent’s services after the first order? These are all great questions. When our clients ask one of our China lawyers to refer them to “good sourcing agents,” we typically ask them two questions: What is the product for which you will be needing a sourcing agent and how do you want to pay the sourcing agent. Once we have answers to these two questions we can then provide them with a short list of potential sourcing agents. We ask the first question because a sourcing agent that is great for sourcing clothes is not the right sourcing agent for sourcing medical devices. The good news on this score is that good sourcing agents don’t source products with which they are unfamiliar. So for instance, if we have a client that wants help sourcing an unusual product and we do not know offhand of any sourcing agents involved with that particular product, we will go to the good sourcing agents we do know and ask them for referrals. We ask the second question because sourcing agents can charge differently and some are less flexible than others. Generally speaking, the more you pay up front, the less you will likely pay in total over time. Some sourcing agents require a large upfront payment to get started and others are willing to work on a percentage basis. Our start-up clients tend to prefer paying a percentage per widget manufactured and our bigger clients tend to prefer paying upfront.